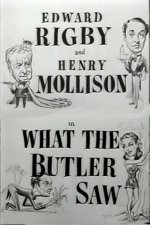 Elderly Edward Rigby heads a strictly B-movie cast in this impoverished (one set), stiffly directed comedy, an early product from the Hammer studio. The plot, about a Polynesian princess who follows her lover, a butler, home to England and causes consternation in a country house, has a distinctly pre-war feel. The title and one saucy scene in which the dusky maiden (played, needless to say, by a frightfully English starlet) has a bath in the sink must have given the censors palpitations.